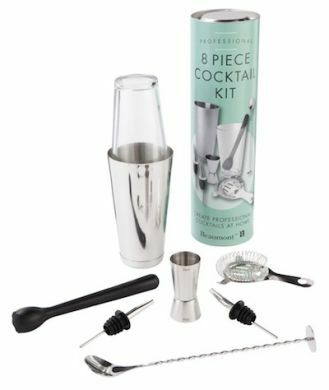 The Beaumont cocktail kit has you covered on this front, with a plastic muddler, 2 stainless steel freeflow pourers, a 25/50ml jigger, a Hawthorne strainer, a stainless steel Boston can, Boston glass, and a cocktail spoon you literally have the entry level bartender cocktail kit at your fingertips – all that is missing is the ingredients – and the ice, don’t forget the ice! 1 x 8½” Plastic Muddler. 2 x Stainless Steel Freeflow Pourers. 1 x 25/50ml *NGS Professional Cocktail Jigger. 1 x 2 Ear Hawthorne Strainer. 1 x 28oz Stainless Steel Boston can. 1 x 16oz Boston glass. 1 x Cocktail Spoon with Masher.